See our Services List for detailed description of our real estate capabilities. 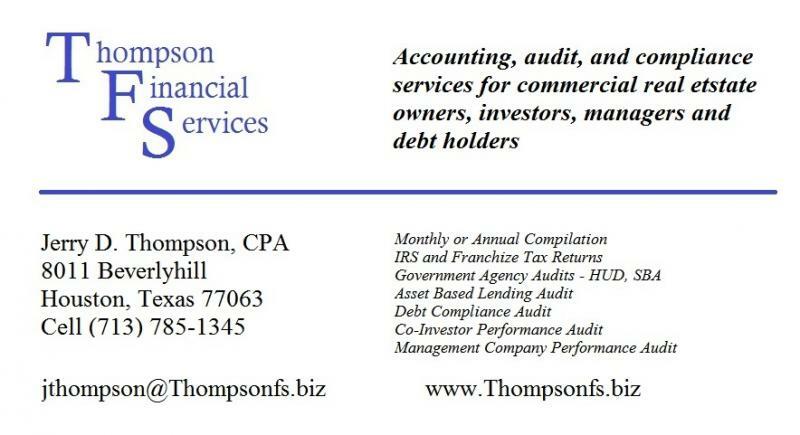 Let Thompson Financial Services quote your next agency audit, accounting or tax work. All service work is subject to approved job scope and estimated fee. Rates may be by the hour or fixed fee. Please contact us anytime! Let us consult with you on your real estate question, issue or need. We look forward to hearing from you. or by calling (713) 203-7548. We look forward to assisting you. Copyright 2011 Thompson Financial Services. All rights reserved.